As I’m sure you are aware, the Local Plan consultation is underway, and it is important that as many people as possible write in to object to continued inclusion of the Blackwell Farm scheme (policy A26). Please spread the word as widely as possible. A standardised response postcard has been produced by Save Hogs Back (see attached). localplan@guildford.gov.uk to arrive before midday 24th July 2017. This must be accompanied by your full name and address. adds to air pollution in neighbouring areas, which already exceeds safe EU limits. Please forward this to anyone who might be interested. If you would prefer to draft your own objections to this site, that would be even better, but please remember to refer to a change in the Local Plan policies and to cite the policy number, and (where relevant) the paragraph, otherwise the Council will disregard it. The latest draft of the Local Plan also removes the provision for an alternative access to Beechcroft Drive & Manor Cottages. The current access (a 90 degree junction on a blind bend of the A3) is dangerous not just to the residents of Beechcroft Drive, who use the junction on a daily basis, but to all drivers travelling on the A3. I would urge everyone to object to the removal of this scheme (SRN6) on safety grounds. The removal of the proposed Beechcroft Drive access suggests that the A3 widening is not going ahead during the Local Plan period, and without this widening, the growth planned for borough in the Local Plan cannot be accommodated. The London Green Belt Council is organising a “Day of Action” for Save Hogs Back on Monday, July 3. Many thanks to everyone who has already helped to distribute the postcards across the west of Guildford. Please comment on these, especially on the more recent Dragon article, as this will help to keep it “live”. Please could everyone with a Twitter account follow: @savehogsback and retweet the Save Hogs Back tweets. Waverley Borough Council’s Local Plan Public Inquiry is currently taking place, and reports coming out of it are not positive. It seems that Waverley is being pushed to accept a housing increase of around 25% to meet the “affordability” test and an addition to the 5 year housing supply, which developers claim is not sufficiently robust. The now agreed starting point for Waverley is 396, (which implies that in order to comply with NPPF 182, Guildford’s starting point would be 600 and Woking’s 301). The Planning Inspector presiding over the Waverley Inquiry was not swayed by arguments about environmental or traffic constraints. He said that “he’d rather have a new house than worry about sitting in traffic“. This entry was posted in Uncategorized on June 30, 2017 by tejstevens. Happy New Year to everyone – I hope you’ve all had a relaxing break. In March, we are due to see yet another iteration of Guildford’s Local Plan and my guess is that the proposed development site at Normandy may be removed (which is good news), but that the Blackwell Farm, along with the other strategic sites, will be put forward again. In December, The Times reported that GBC would gain £68m (in new homes bonus payments) for building 8,200 homes on the green belt. This incentive is probably the Council’s driver – along with pressure from the University, which seeks to secure its financial future, and from the Local Enterprise Partnership. The only obstacle to the Council’s development plans is the lack of infrastructure. The Council is now looking at a tunnelled A3 bypass, but such a scheme would be costly and take years to deliver (if ever). In the meantime, if mass development goes ahead, Guildford will probably become like central London, with average speeds on its main roads of 17mph. Just before Christmas, the University submitted planning application 02/P/02505/S106/01, which seeks to remove the conditions imposed it when Manor Farm was taken out of green belt to facilitate the University’s expansion. This application includes its request to overturn Clause 15 of the S106, which relates to Hazel Farm. Under this clause, the University was required to relocate students living on the Hazel Farm campus to Manor Park once 2,500 students residences had been built, and to release the 132 residential units at Hazel Farm onto the housing market for refurbishment or redevelopment. The University is now arguing that this obligation is no longer deliverable because of the change in policy relating to the Thames Basin Heath Special Protection Area (SPA), which does not allow residential development within 400m of the SPA. This is only partially true; whilst the Hazel Farm site would not be suitable for general residential development (presumably because of the impact of family pets on protected bird species) Natural England would allow the site to be used as a care home or home for the elderly. If Hazel Farm were put to this use, it would reduce some of the housing need in Guildford by providing much needed accommodation for the borough’s ageing population. Given Guildford’s ‘acute’ housing need, and particularly the need for affordable housing, I would expect GBC to ensure that this S106 clause was enforced. I have contacted the Lib Dem ward councillors for Onslow and requested that they call in this application, but have not yet received a response. Therefore, it would be great if Save Hogs Back supporters could object to this application by emailing planningenquiries@guildford.gov.uk, ideally citing your address, before January 17. If the Council refuses this application, it will mean 132 residences that don’t have to be built in the countryside or crammed into the town centre. This application is of particular concern to residents at Beechcroft Drive as it also includes a clause to waive the requirement for a visitor centre at Manor Farm, but to retain a car park (for disabled visitors). The car park would be adjacent to the ancient woodland at Manor Copse. The homes at Beechcroft will overlook this car park. It seems unnecessary to tarmac over part of a field to provide disabled parking for a visitor centre that doesn’t exist and a belt of ancient woodland that is poorly maintained and inaccessible to wheelchair users. Blackwell Farm Developments (a subsidiary of the University of Surrey) has submitted a deposit relating to the public and permissive rights of way across its estate at Blackwell, Chalkpit, Wildfield and Manor farms. I suspect that this is to lock down the land ready for development. Tim Harrold (Chairman of CPRE Guildford) has alerted the Open Spaces Society to this deposit and will keep us posted. This entry was posted in Uncategorized on January 9, 2017 by tejstevens. The Times has reported on a leaked document suggestion that the Government plans to further relax green belt protection. There is to be a debate about housing in Guildford this evening at 7pm at the University, chaired and broadcast by the Surrey Advertiser. It will be an excellent opportunity to point out some of the flaws in the Council’s approach to the Local Plan generally and to Blackwell Farm in particular. I’ve outlined below a few of the questions I think it would be good to have answered, and it would be great if as many of you as possible could go along and raise some of these, as well as any questions you yourselves may have. All these questions have been raised by many of us before, but we still haven’t had any satisfactory or straight answers to them. Who is the local plan for? Shouldn’t it be for the people of Guildford? If Guildford cannot deliver genuinely affordable homes (which it won’t) then it would only appear to serve only landowners and developers who are going to cash in, as well as the Government’s agenda to build the country out of the current economic crisis. It wouldn’t appear to do anything to improve the quality of life of people who currently live in Guildford or for future generations. 40% of housing that landowners and developers deliver is actually affordable when the Local Plan allows them to simply argue that infrastructure costs make this level of affordable housing provision non viable. The infrastructure costs associated with Blackwell Farm, for example, are in excess of £50m – and this doesn’t even include the costs of the school, the reservoirs to prevent flooding, or any sewerage infrastructure etc. Won’t you end up with a bigger Guildford but with all the same problems in the longer term? But of course, with more congestion/noise/ pollution and loss of the natural environment as a result of green belt being lost. The University has repeatedly and publicly argued that it needs to build on Blackwell Farm in order to provide homes for its staff and key workers. However, it was given the opportunity to build 300 such homes in the last Local Plan and has only built 30 of them (ten per cent). These were supposed to be separate dwellings with gardens, but in reality, they formed units within the student halls of residence. If the University needs these homes to be built, why doesn’t the Council take steps to ensure that it builds the remaining 270 homes on some of the 63 hectares the land that was taken out of green belt for this purpose in 2003? Refusing to roll back the green built a second time, will ensure that the University builds these houses where it promised they would be built. At the last Local Plan in 2003, the University pushed for 63 hectares at Manor Farm to be removed from the green belt specifically so that it could expand and provide student and staff housing. Most of that housing has not been delivered – it still owes 3,200 units – despite the student population growing to 14,000 (1,500 above what it planned in 2003). The University is now asking for more green belt land. No wonder Guildford’s residents feel aggrieved. If this housing was built, it would free up around 1,500 of the cheaper homes in the town centre, which key workers desperately need. Shouldn’t Guildford Borough Council be pushing for this rather than planning to build across farmland at Blackwell Farm, which forms the views from an Area of Outstanding Natural Beauty? The University has been wasteful with the former farmland already gifted to it by the people of Guildford. Its Research Park has been built at very low density – 27 hectares for just 65,000m2 of office space, and there are more than 20 hectares of surface level car parking across its estate. Shouldn’t GBC be encouraging the University to use this land more efficiently by building additional office space above the surface car parks, and by introducing mixed-use development across the site. and to build offices and flats above its car parks before handing over more green fields? Building at the same plot-ration as the approved Master Plan for Manor Park would provide six times the office accommodation on the Research Park than exists at present. 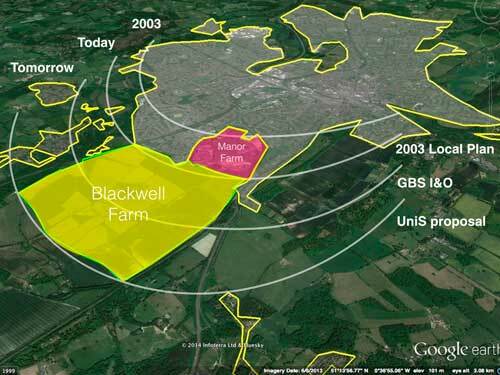 Can GBC really justify taking neighbouring land out of green belt instead? Doesn’t GBC have a duty to protect our natural environment – particularly when the Council was elected on its manifesto to protect the green belt – naming Blackwell Farm in its election literature in particular? This entry was posted in Uncategorized on November 28, 2016 by tejstevens. The consultation closes on July 17, 2016. There was a huge amount of unrest in the public gallery at the Special Council Meeting on May 24, 2016 as people felt that councillors had broken their pre-election promises to protect the green belt (70% of the 14,000 new homes will be on the green belt). Clls Phillips and Goodwin (representing Onslow Ward) put forward an amendment to remove Blackwell Farm from the Plan, but it was not carried, and all the councillors representing Shalford and Worplesdon (except Bob McShee) voted against the motion. Cllrs Phillips, Goodwin and McShee also voted against the Local Plan going to consultation. They raised concerns that the Plan was going forward without councillors having sight of the proposed transport strategy to accompany it. Cllr Phillips put forward his case for the amendment at 2 hrs 19 into the meeting and I spoke at around 31 minutes. Normandy Action Group and Save Hogs Back have agreed to work together to oppose Blackwell Farm site (1,800 houses) and the Normandy site (1,000 houses behind Wanborough Station) going forward for development. GBC has agreed that if the secondary school proposed for the Normandy site is not needed, there would be no “exceptional circumstance” for removing the Normandy site from the green belt. The school will, in a large part, serve the proposed new Blackwell Farm development so if Blackwell Farm is removed, it is highly likely that Normandy will be also. Save Hog’s Back received some coverage in last week’s Sunday Telegraph online news: http://www.telegraph.co.uk/news/2016/05/28/home-counties-green-belt-risks-becoming-giant-london-suburb/ Sadly, the story was cut back in the printed version. This entry was posted in Uncategorized on June 4, 2016 by tejstevens. There are rumours that the next consultation on the draft Local Plan will be a “Regulation 19 review” (which is basically a check for soundness and compliance). If this is the case, then any further changes to the Local Plan will be minor, and the so called “strategic” development sites already earmarked will go forward. This is despite pre-election promises for a fundamental review of the Local Plan and despite promises to protect the green belt and Blackwell Farm. It is time to start serious fundraising as we are going to need a barrister (with in-depth knowledge of the planning system) to represent us at the Inspector’s Inquiry. The cost will be in the region of £5-6k so we are now asking for donations. These can be made via the recently updated Save Hogs Back website at http://savehogsback.co.uk/?page_id=263 – just click on the “Donate” button. Please give what you can. The University has spent thousands on consultants for this development, but we are relying on the generosity of our supporters in order to save this important landscape. It’s time to get baking again! Save Hogs Back is taking a stand at the Wood Street Village Show this Saturday (July 18). Neville, Peter, Diana and Mike will be on hand to spread the word about the campaign and will be selling cakes to raise funds. Last year, we raised £80 at the Show, which went towards the cost of printing our brochure. It would be great if supporters who had the time could bake a cake or two to sell. BTW, copies of our brochure were sent off to all new councillors with an invitation for them to visit the Hogs Back site. We are still waiting on their responses. We have recently added the Save Hogs Back to the national campaign website 38 Degrees. 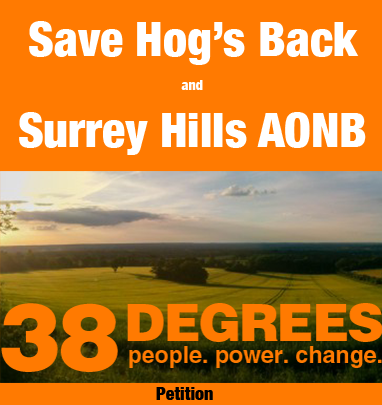 Please could you sign our petition on this site (https://you.38degrees.org.uk/petitions/save-hog-s-back-and-the-surrey-hills-aonb). Also, please could help spread the word about this petition among your friends (using email, Facebook and Twitter) – the aim is to raise awareness about our campaign nationally, and if we can get around 8,000 signatures, GBC and Brandon Lewis will have to take note. Everyone present seemed to be supportive – and one member said that if GBC could build on the Hogs Back, it could build anywhere. This entry was posted in Uncategorized on July 13, 2015 by Karen Stevens. We have just created the petition “Save Hog’s Back and the Surrey Hills AONB” and wanted to ask if you could add your name too. This entry was posted in Uncategorized on July 9, 2015 by Karen Stevens. Local Plan events – let the Council know your views! Make sure you respond by writing to your Councillor. Take a look at our Call for Action which sets out issues regarding the development and who you should contact. This entry was posted in Uncategorized on October 5, 2013 by tejstevens.